Over the weekend, News agency Thompson Reuters hit by dual hacking attack, with last security breach the media company experience in which hackers taking control of its Twitter account dedicated to tech news, The Next Web reports. The hackers turned the focus from tech news towards the Middle East and had posted a series of pro-Syrian government tweets. 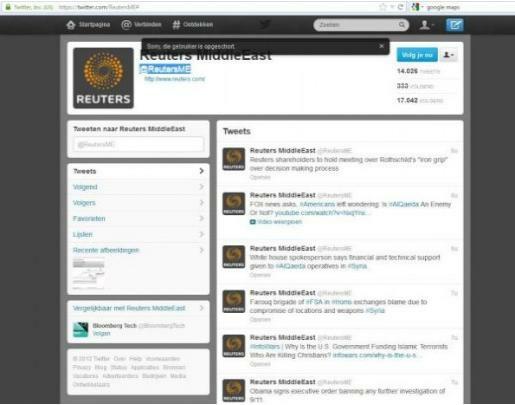 The account was renamed to @ReutersME from its original @ReutersTech. @ReutersME: Obama signs executive order banning any further investigation of 9/11. The media company says it is investigating into the matter. Well, we keep an eye over the issue and will inform as soon as we get any further updates.